Announcement Welcome to my shop~ I am in the middle of creating new listings. In the past I have had 400+ quilts to display my work, I am working to consolidate those. If you ever want to see more photos of my work feel free to message me and I can direct you to my Facebook Business page. I make Tshirt Quilts, Memory Quilts, Rag Quilt with clothing and Pillow Shams. If you have questions about the type of quilt that will fit your needs please message me, I would be happy to work with you on creating a quilt filled with precious memories. "Jenn did a FANTASTIC job on this memory quilt for my mother's birthday! It was a very special piece for my mother's late husband, so needless to say, it was important for perfection and perfection we got. Jenn was recommended to me by a friend that had several quilts done by her, she said she was amazing and she is!!! Thank you so much Jenn for your beautiful work!" "Jenn did an amazing job on all four of my quilts! I ended up purchasing 2 t-shirt quilts and 2 memory quilts. She walks you through the entire process, communicating with you every step of the way from start to shipping. What I liked the most about working with her, was her compassion. I ordered the quilts less than 2 months after my Dad passed away unexpectedly. I knew I wanted to have these made as gifts for my family but trying to select which pieces was overwhelming and emotional and Jenn was so compassionate as she offered suggestions on how to choose which pieces to use. I highly recommend her shop and have referred other family members to use her as well." "After A LOT of shopping around on Etsy, I messaged Jenn (sunshineofautumn) and the entire process was wonderful. I got to pick out the fabric from a wholesale website and we negotiated the price based off of other fabric Jenn had available. I sent her the shirts and the quilt was waiting for me at home when I returned from vacation! Wonderful experience! I would use again for any of my future quilting needs! Thank you Jenn!! !" Jenn was a pleasure to work with during the quilting process. She kept me informed of each step and decision that was to be made for my quilt. Most importantly, the turnaround rate was phenomenal, facilitating every aspect of my purchase. The finished quilt far exceeded my expectations and showed craft and quality work. I am recommending her to many friends and family and look forward to working with her again! All my items come from a smoke free home and are made by me. If you would like something similar feel free to ask. I will ship internationally, please message me so I can get you the correct rate for the item you would like to purchase. Thank you for your interest and have a Wonderful Day. Welcome to my shop~ I am in the middle of creating new listings. In the past I have had 400+ quilts to display my work, I am working to consolidate those. If you ever want to see more photos of my work feel free to message me and I can direct you to my Facebook Business page. Tshirt Quilt from 15 of Your Own Ttee shirts. Tee Shirt Quilt from 15 of your Own tshirts. The seller had excellent communication and sent pictures throughout the process to make sure I liked everything! I received an absolutely beautiful memory quilt that will be a special part of our family for a long time! Jenn was wonderful to work with. She worked very hard trying to get the quilt to me in time for the holidays. Her quality of work is amazing and she made sure we would be happy with it when she finished. Thank you, Jenn! WE LOVE IT! Take your loved ones Clothing and create a Memory Quilt. You will have these memories to treasure forever. I started quilting 22 years ago when my oldest child was born. I started out of necessity. I taught myself the basics and learned to enjoy it very much. I had many friends and family tell me to open up my own business. Online shopping made that dream possible. I have been on ETSY since 2008, before that I sold quilts via EBAY. I get many questions about the name of my shop. As a child my grandfather called me Sunshine. My grandmother would often sing me the song, "You are my Sunshine". My favorite season is Autumn. I love the fall colors and the beauty of the cool evenings. So when I was thinking of a name for my shop and required DBA for the IRS, I decided to combine the two. Therefore, Sunshine of Autumn Quilts was born. I love meeting new people, helping them find the perfect fabrics and then the process of creating their quilts whether they be themed fabric quilts or the newest fad "the T Shirt Quilt." My goal is to create a quilt that will hold all of your dearest memories. My favorite quilts to create are the caring quilts where I take a loved ones clothing and turn them into a memory blanket for those that are still here. All of the quilting process is done by me. I do not have a staff or outsource any of the process. I work on one order at a time until it is finished. Most quilt orders are back in your hands within three weeks of receiving your items and your fabric. I would be honored to have your quilt order, so please feel free to take a look and contact me if you have any questions. Thank you for stopping by. I am a christian stay at home mother of three young adults and have been married 24 years. My oldest is a recent college graduate, and my other two are college sophomores. I love to quilt and have made over 400 t-shirt, caring/memory/rag quilts. 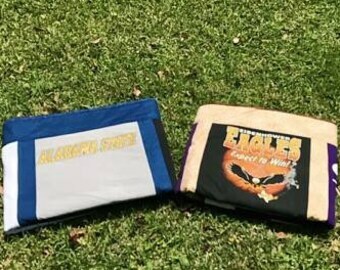 I love to help you create lasting memories by providing custom orders on Tshirt Quilts. I do create other types of quilts on request, you can view my sold orders for more details. Typically Tshirt type quilts take roughly two to three weeks once I have your shirts and material on hand. Please feel free to convo with me if you have any questions. Your quilt is made in a smoke free loving home. Customer pays to ship items to me. I am not responsible if those items are lost. If fabric is ordered I will return fabric and remaining balance to the customer, they pay to ship the fabric to them. The customer is also responsible for payment and insurance purchase fee (please request insurance) for shipping the finished quilts back to their home or final destination. I am not responsible for lost or damaged packages through the Post Office, UPS, Fed Ex or other carriers. I take photos of the quilts prior to shipping and can send finished photos of the quilts to show the quality of work and condition of quilt when put in the box to mail to the customer. If you would like insurance please contact me so I can add that to your purchase. If there are any problems with an item you purchase from me, please contact me directly. Your items come from a Non Smoking Home and are made/crafted by me personally. I accept personal checks, money orders, paypal and direct pay through ETSY. I also will accept partial payments just message me so I can help you if you have any questions. If you do pay by check I will not ship your quilt back to you unless the payment has cleared but so far that has never been an issue. If you would like to purchase more than one item, please contact me, I would be happy to combine shipping charges. I ship through the post office, priority mail. I will ship internationally. Please convo with me so I can get you the correct rate and adjust shipping for your order. If you want insurance etc please let me know prior to your purchase so I can account for that extra cost. Most orders take 1-2 weeks, some as long as 3 weeks. If you need an order by a specified date please let me know and I will do my best to accommodate you. My quilts are washable. I recommend washing in cold water and tumble dry on low. If you have the option to use a machine without an agitator I do recommend that.